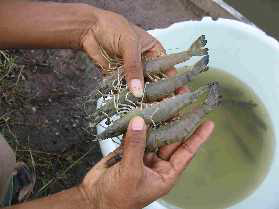 Shrimp farming is an important agricultural activity in Nanggroe Aceh Darussalam. Prior to the tsunami, in 2003, Dinas Kelautan dan Perikanam estimate that Aceh produced 10,300 tonnes of shrimp valued at US $46.5 million. 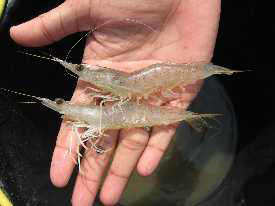 The major proportion of this shrimp production was the black tiger shrimp (Penaeus monodon) which made $41.8 million. There are approximately 15,000 brackishwater farmers in Aceh, through typically they are small-scale farmers with less than two hectares of pond area. These figures only include farm owners or operators and therefore don’t take into account all the workers involved in the production supply chain such as labourers, input suppliers, traders, marketing and service provision. The Food and Agriculture Organisation (FAO) estimates each hectare of pond provides direct employment to 1-3 people, with up to 200,000 people in Aceh, employed directly in brackishwater shrimp and fish farming. Shrimps are stocked at low density. Low density allows for less usage of required feed and fertiliser inputs, for example many farmers do not feed for the first month of crop production relying on natural pond productivity to provide food for the juvenile shrimp. Some even wait till closer to harvest time, which in turn minimises environmental damage from nutrient release. Farmed shrimp are harvested at 20 to 30 grams in three to four months. Highly resilient to variations in salinity and pond temperature. Good quality produced in Aceh. Is a local shrimp species. Little is known about suitability of the species for aquaculture in Aceh. Large fast growing shrimp similar to P. Monodon. Brings disease such as Taura Syndrome Virus (TSV). Requires super intensive production systems therefore a higher investment, hence it is not suitable for small scale farmers, as it is not financially viable. Increased environmental impact due to intensive production system. Prices are lower than black tiger shrimp and appear to have stabilised at EU5/kg whereas black tiger shrimp prices are predicted to increase.